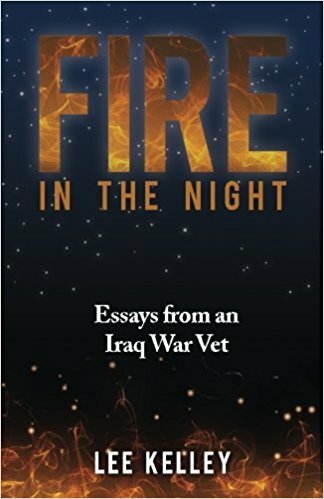 Fire in the Night is, like many other books, a soldier's record of the big adventure of his life -- his military service during war. If viewed as such, author Lee Kelley's piece works. However, Kelley's natural talent as a writer elevates his simple war stories to art. The man's very soul infuses each essay with humanity that moves even the stay at home, uninitiated reader. He reaches across generations, politics, and culture to create empathy in alien hearts. Lesser writers might say, "While I was deployed, I was homesick." Kelley's thoughts of home are more delicate and he presents them as water-colored prose poems. "When my tour is over," he says, "just drop me off on any Arizona or Utah highway, where the Buttes and the Red Rock Canyons create optical illusions in the distance and across the horizon -- I'll walk home." Later in the book, he writes a whimsical letter to a Cryogenic Firm about freezing his body and then awakening him in the midst of some extraordinary circumstance. For example, "Push a button. I'm standing on the highest point on the Planet, Mt. Everest, stretching my arms upwards to the sky, filled with wonder at the richness of life." Such images, coming from a soldier serving in the harsh climes of war-torn Iraq, fills the reader with hope. For all the loveliness of Kelley's writing, the cover is a simple collage. A medal fills the left top corner, draped dramatically over the silhouette of a soldier prepares the reader for something warlike and unusual -- but nothing really prepares the casual browser for the creativity inside. Fire in the Night is the kind of book that can be read in one sitting. Kelley's Iraqi interlude lasted 544 days. During that time, he experienced the country viscerally. It can't be described in a review, only the authors" own words will do. "The dust there is instant chocolate pudding ' just add water.' "These men see the night through thermal imaging scopes -- and night vision goggles. Electric green and red are the colors they become familiar with. They can see a mouse running in a field at 100 meters. "The next morning, the sun looked just like a song." At the end of one of the last essays "Squint", the author issues a challenge to the reader, "My time in Iraq changed me in countless ways. And perspective is such a fleeting and mutable thing. For example, I've tried to give you some kind of glimpse here, but sight and thoughts can shift so quickly, like right now and you sit reading these words. Just squint. See it?" Already a freelance writer, Lee started a blog when he was sent to Iraq in 2005. His family and friends expected to read of his experiences, and a blog was the perfect medium. A hometown reporter visited his unit in Iraq, and Lee ended up on the front page of the Salt Lake Tribune. That's how it all began. Since then, he's been in the top 10 military blogs on milblogging.com for years, featured in TIME magazine, read some of his essays on radio shows, and even been on the local news in Salt Lake City, Utah. Through it all, readers have been very supportive of Lee's writing and he has received thousands of queries about when he might publish a book. Here are 53 of the most popular essays. They have been adapted from the blog, and writing that he's done in other forums, such as The New York Times and Doonesbury.com. All of the work in this book was either written while he was still in Iraq or as a direct result of his experiences there.